A US Airways Airbus A330-200, registration N284AY performing flight US-715 from Venice (Italy) to Philadelphia,PA (USA) with 185 people on board, was enroute at FL390 over the Atlantic Ocean about 20 minutes into the crossing when the aircraft turned around and diverted to Dublin (Ireland) reporting a number of crew members and passengers had become ill with nausea and dizziness. The aircraft landed safely on Dublin’s runway 28 about one hour later. 9 cabin crew were taken to a hospital. The remainder of the flight was cancelled, the passengers were taken to hotels. Passengers tweeted that numerous cabin crew complained about medical issues. 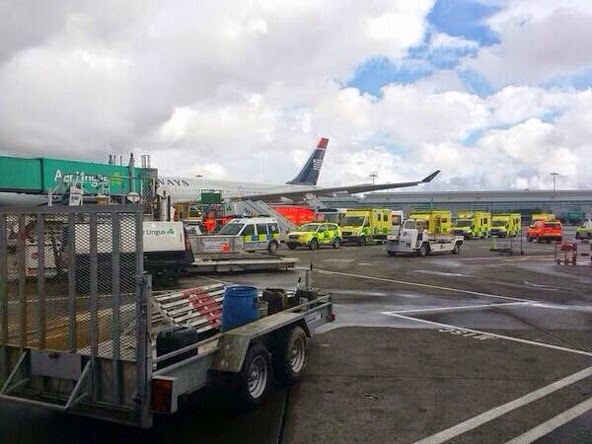 Dublin Airport stated that ambulances and paramedics were dispatched to the airport, 9 cabin crew were taken to hospitals.